First cut some dragonfly shapes out of black card then cut holes out of the wings so that these can be filled in to make the suncatchers. Roll out some contact paper onto a table of box, you will need to tape each of the sides down as it’s very sticky and will just end up in a big ball otherwise! I use washi tape for this as so far it’s never left a mark on anything and it also helps me to justify my washi addiction to my husband. Cut your cellophane into little shapes, you can of course use coloured tissue paper for this but cellophane is much brighter – we make quite a lot of suncatchers and I would never go back to tissue paper as the colours stay much longer. At two years old my daughter enjoyed picking up the small pieces of cellophane and putting them onto the contact paper, she really enjoys just playing with the contact paper too, getting her hands and fingers stuck on it. 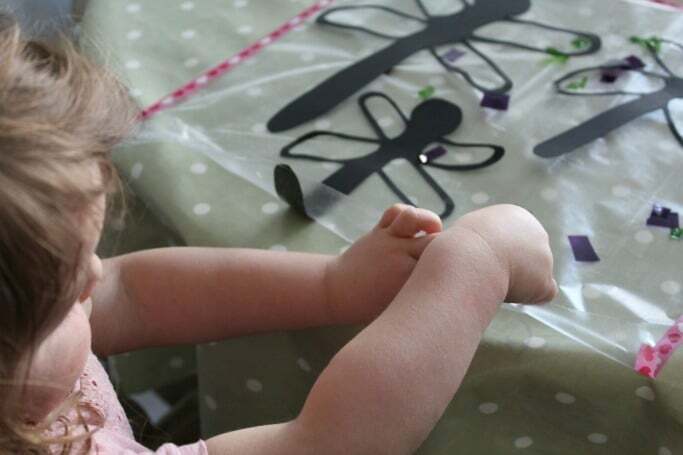 The picking up the small bits of cellophane is great for fine motor skills, younger kids are likely to place or pour the pieces all over the contact paper while older kids are more likely to fill in the dragonfly’s wings. 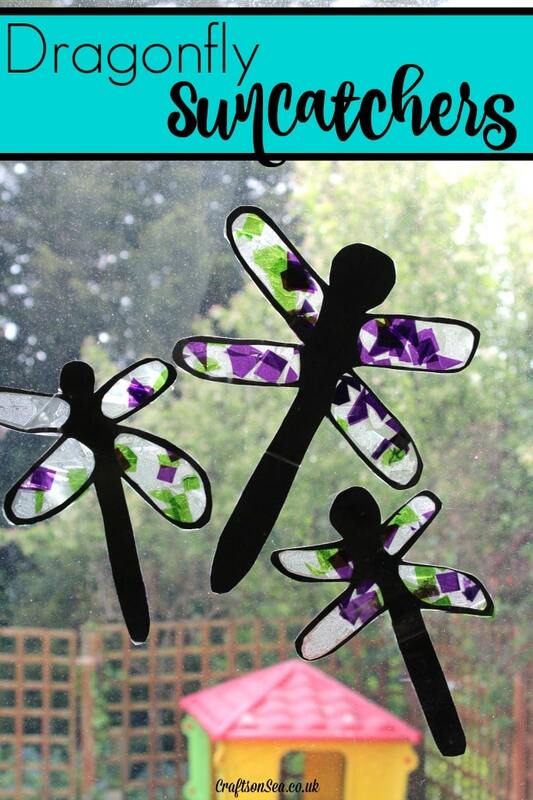 Once you’ve finished place another sheet of contact paper on top to secure it all in place and then cut around the dragonflies, they are now ready to put in your window either by using a needle and thread to make a loop you hang them from or rolling a bit of sellotape into a loop to stick at the back of your suncatcher and attach to your window.